Some things are so easy to make yet can seem as though they should be hard. 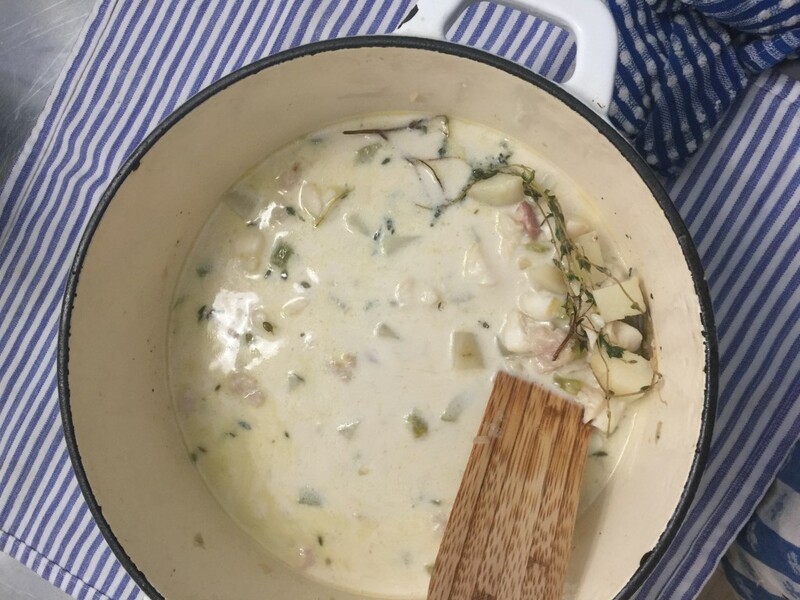 Old school chowder is one of those dishes. Many fish markets sell “chowder fish” at a ridiculously reasonable price which is usually the leftover bits and ends of mild white fish that have been cut off from the bigger fillets of haddock, cod, halibut etc. Grab it when you can. Then you only need a few other ingredients to make the soup. Chop an onion and a celery stalk, and saute them in butter over low heat for 5 minutes. Add a chopped potato and some thyme, cover in liquid (fish stock, clam juice, chicken stock) and simmer until potatoes are almost tender. Stir in some cream (milk, half and half or heavy cream). Gently stir in the fish (chopped), and finished cooking just a few minutes until the fish is opaque. Season with salt and pepper. Serve with fresh chopped parsley and crackers. Yum.